Battlestar Galactica will probably always be relegated to second runner-up position behind Star Wars and Star Trek in the battle for space franchise supremacy. 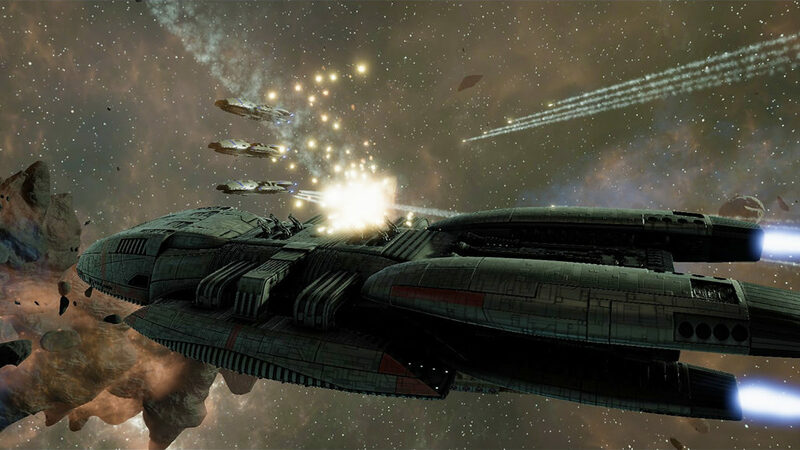 This eternal little brother status extends to the world of video games – there’s been a ton of memorable Star Wars games, and a few great Star Trek ones, but poor ol’ Battlestar has been left out in the cold. Publishers have mostly ignored the series, and the few BSG games we have got have been pretty rotten. Battlestar Galactica Deadlock takes place in the same universe as the 2004 series, but don’t expect to see Starbuck, Apollo, or any other recognizable faces. 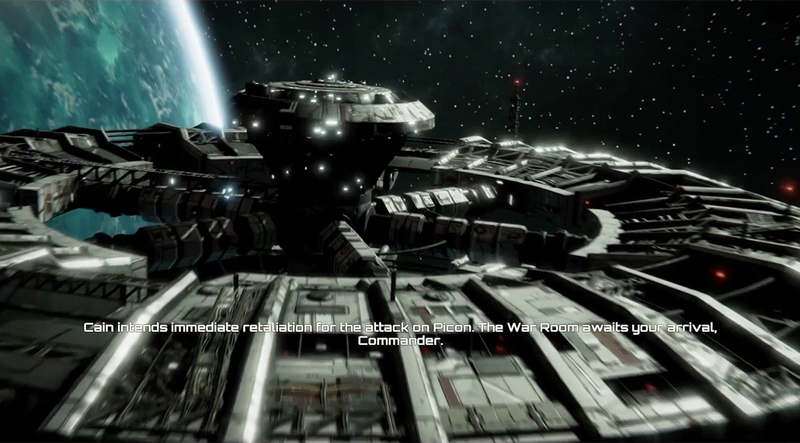 This game takes place 50 years before the events of the TV show during the first Cylon War. Getting to see how humanity’s battle with the dastardly toasters began sounds interesting, but trust me, it isn’t. On TV, Battlestar Galactica was all about memorable characters, intricate politics, and gripping moral quandaries, none of which make the jump to this game. Deadlock’s characters are forgettable, its plot is brainless, and everything just feels very dry. Deadlock’s visuals don’t do much to spice things up. 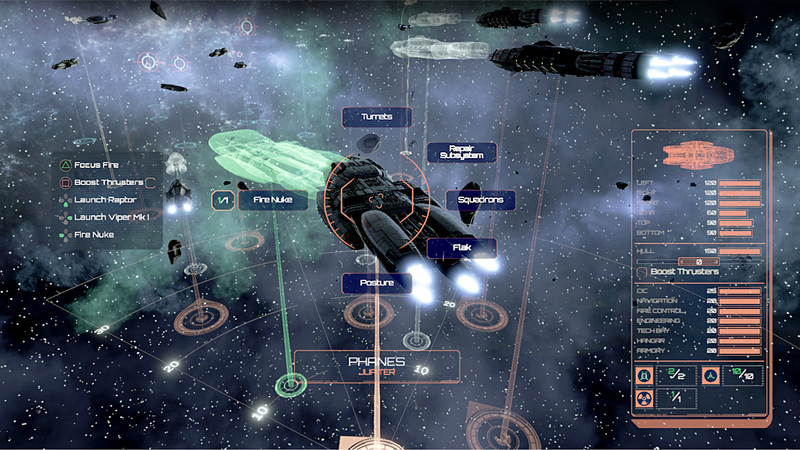 You’re going to be spending a lot of time squinting at tiny gunmetal-gray ships against dark starfields. Not a lot of variation or excitement. At least the music is good. Heavily inspired by Bear McCreary’s score for the TV show, Deadlock dredges up some excitement with its pounding drums and stirring Celtic themes. Battlestar Galactica Deadlock puts you in command of the full Colonial Fleet, which requires you to engage in a combination of strategic planning and tactical battles. 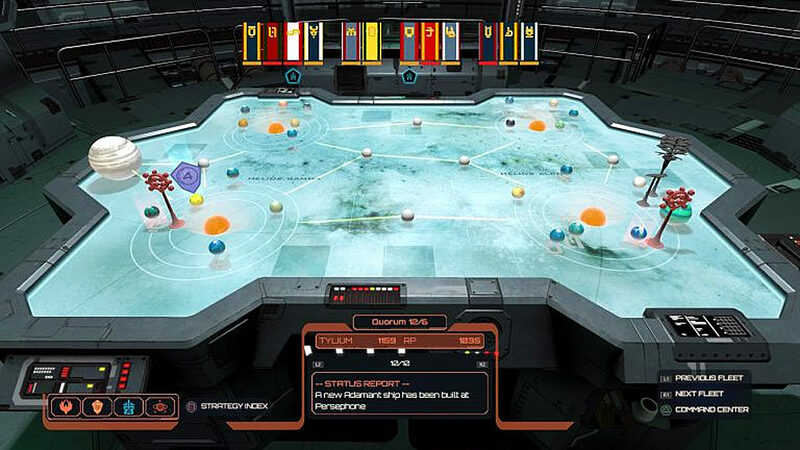 The strategic part of the game is fairly straightforward – you’re presented with a war table representing the Cyrannus star system and its 12 colonies. These colonies are under constant Cylon threat and must be defended if you want them to keep sending you precious tylium. To do this, you must build ships, form fleets, assign them officers and then send them out to blast the bands of roving toasters. While the game does require you to juggle several things at once, a complex game plan isn’t really required. Build as many ships as possible and take out all the Cylons as often as you can, and you’ll do fine. There’s certainly nothing approximating the complex politics of the TV show – as long as you shoo the Cylons away, the Colonies will stick with you. Deadlock’s tactical battles are a bit more interesting. Battles are turn-based, with you and your opponent issuing commands to your ships, then watching the results in real time. Your ships can move freely in 3D space, which can be tricky to get a hang of (particularly on the PlayStation 4), but the controls become second nature soon enough. Each class of ship, from the maneuverable Manticor to the intimidating Jupiter Battlestar, have their own personality and role to play in battle. Learning the intricacies, like where each ship’s guns are located and where their hulls are the most vulnerable, is satisfying in a nerdy sort of way. Unfortunately, while Deadlock’s ships are a varied lot, the battles they engage in quickly start to feel rather samey. There’s only so much you can do with ships floating in the voice of space, I suppose. It’s mostly a numbers game – you and the Cylons blast at each other, and whoever has the bigger, more powerful fleet, wins. Occasionally, the toasters will “ambush” you by adding more ships to the battlefield, or you’ll be sidetracked with an extra mission requirement (blow up some satellites, investigate a certain area of the map, etc. ), but there isn’t a lot of real strategy to the showdowns. As long as you make sure you’re well-equipped and don’t get sloppy, you’ll usually win the day. Which isn’t to say the game can’t be frustrating at times. Deadlock’s hacking mechanic is particularly infuriating – the Cylons can easily shut down the weapon and navigation systems of any of your ships, even the big bad Battlestars, reducing them to useless husks. Aside from blowing up the ships doing the hacking, there’s little way to defend yourself, and you’ll often find yourself with half your fleet incapacitated. Yeah, hacking was one of the Cylons’ most dangerous tools on the TV show, but being faithful to the source material doesn’t always equal fun. As you delve deeper into the game, you’ll also start to notice issues with balance. The expensive Battlestars aren’t as game-changing as they could be, while some of the cheap early-game ships, like the firepower and fighter-packing Adamant, are surprisingly deadly. There’s something awry when I don’t really care about buying Battlestars in a Battlestar Galactica game. Ultimately, what really cripples Battlestar Galactica Deadlock is its pace. This game is slow. Glacially, mind-numbingly slow. Story missions can take 45 minutes to an hour to play through – longer if you lose and have to retry. Even minor skirmishes can eat up 20 or 30 minutes. It would be one thing if Deadlock’s battles were epic affairs between dozens of ships, but they aren’t. You can never go into battle with more than seven ships, and the Cylons usually don’t have that many more. Thankfully, you can automate minor battles, but then you open yourself up to randomly losing important ships. But hey, on the bright side, Deadlock’s sluggish pace does stretch the game to a decent length. You could conceivably blitz through all the story missions in around 12 hours, but those who take their time and dig into the strategic side of things could take up to 20 hours. The game also offers up multiplayer skirmishes, although the Colonial and Cylon forces aren’t particularly well balanced, making the battles less fun than they ought to be. Whether or not you get your $40 worth is largely dependent on your patience. Considering how few have collected the game’s basic story mission trophies on PS4, it seems like a lot of folks are giving up on this one early. 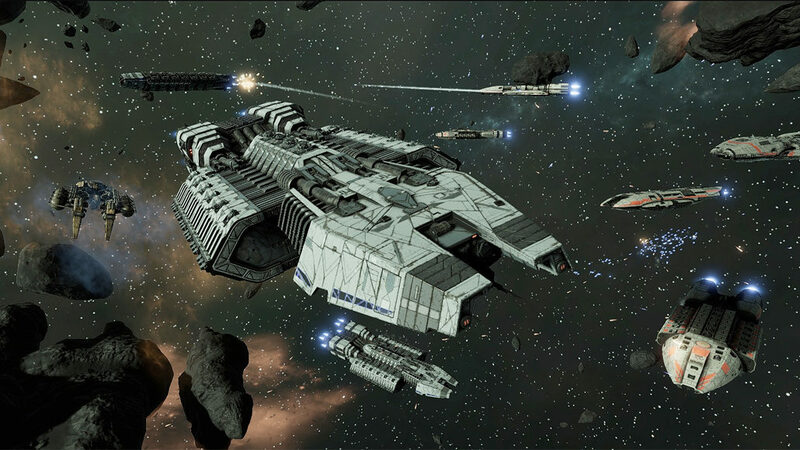 This review was based on a PS4 copy of Battlestar Galactica Deadlock provided by publisher Slitherine Ltd. You can purchase the game for PC via Fanatical. Battlestar Galactica Deadlock is a competent, if somewhat unbalanced and painfully slow, tactical space combat sim. Unfortunately, it’s not much of a Battlestar Galactica adaptation, as it totally lacks the series’ personality, immediacy, and heart. Those obsessed with the nitty-gritty of BSG’s space battles may want to give Deadlock a shot, but most fans should probably give this unrefined nugget a pass.